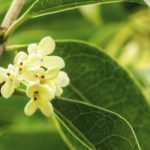 What Tree or Shrub Has Large White, Velvety, Fragrant Flowers? A neighbor of my mother's neighbor has a tree or shrub that hangs over into her yard. She clipped a piece off and let me smell the flower. I have never smelled anything so beautiful in my life. It is a heavy white flower. It has a velvet texture. The flowers are about the size of a closed fist. It is more round in shape. It is shaped like a carnation, but believe me the texture and weight is nothing like a carnation. It sounds like a camilla or a gardenia.